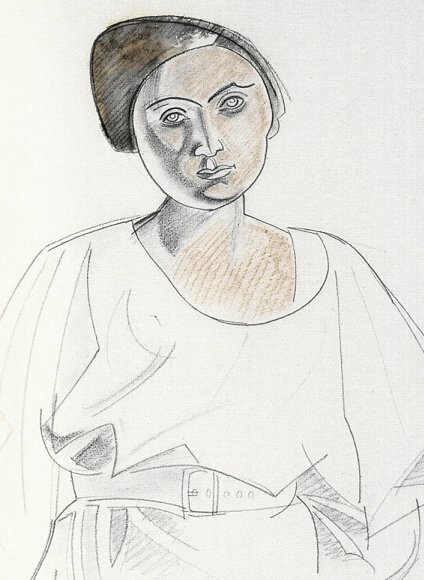 ‘L’Ingenue’ 1919, by Wyndham Lewis. In the NPG 2008 Lewis show, this was identified as Lewis’s partner Iris Barry, but the fullness of the face hardly seems a fit. Could this be an image of Jessie Dismorr? Critical attention to Dismorr’s writing has focused on her six pieces in the Vorticist house magazine Blast 2 of 1915, but a proper consideration should take into account not only the nine poems published by Pound in The Little Review in 1918 and 1919 but also the seven unpublished that survive in the manuscript collection “Poems 1918” given to the American sculptor John Storrs, now with his papers in the Smithsonian. Perhaps these latter were not submitted to Pound, or perhaps they were considered to “detract”. Or maybe Dismorr herself pulled them in response to the savage attack on her work in the pages of the Review by Yvor Winters, of which more later. On the pages that follow I’ve pulled together all these, transcribing “Poems 1918” from the online images of the manuscript and comparing the texts there against the published versions. To these I’ve added Winters’s spiteful hatchet job on Dismorr’s poetry and the ensuing defence by poet John Rodker, who had just taken over Pound’s role as “Foreign Editor”. The final page contains Dismorr’s two substantial texts on art from this period: “Critical Suggestions”, an aphoristic manifesto of aesthetics and her last piece to appear in The Little Review, followed by her 1922 review of “Some Russian Artists” at the Whitechapel Gallery written for Wyndham Lewis’s The Tyro 2. All 28 items are listed below with links to their pages. Beyond these, I’m only aware of a couple of much later poems published in the London Mercury of 1935 with the encouragement of Roger Roughton and George Barker. Her articles on Wyndham Lewis and Henry Moore, written for Roughton’s projected periodical, do not seem to have seen print. But there may well be other pieces of which I’m ignorant. As with Dismorr’s paintings, the indispensable published reference remains Quentin Stevenson’s account in the Fine Art Society catalogue of 2000. Now out of reach of squalor and glitter, I wander in the precincts of stately urban houses. Moonlight carves them in purity. The presence of these great and rectangular personalities is a medicine. They are the children of colossal restraint; they are the last word of prose. (Poetics, your day is over!) In admiring them I have put myself on the side of all the severities. I seek the profoundest teachings of the inanimate. I feel the emotion of related shapes. Oh, discipline of ordered pilasters and porticoes! My volatility rests upon you as a swimmer hangs upon a rock. A case could be made for some overall decline in Dismorr’s writing from this high point. A bit of pruning might have helped certain pieces, and the register of many is a kind of overwrought metaphysical confessional which can be an acquired taste. Some are populated almost entirely by abstract nouns; evidently Dismorr did not subscribe to the nominalism informing much Imagism, which, in its denial of enslaving universal entities, derived from the Stirnerite anarcho-individualism of Dora Marsden and others. Her imagery is often metaphorical, not concrete, and transactions seem to take place within some personal inner space detached from specifics. Her withdrawal from the urban observations of 1915 is a bit of a loss. Erect and of a curious emaciation the tall virgin paces the sands at nightfall. Around her limbs the wind twists her sinuous garments, the locks are whirled about her bossy temples. The treasure within her bosom is the ﬁnely selected material that ﬁts into a little space. Delightful is her laughter, the chime of true appreciations. Clear her tones, free from malice. How fairly toward life she lifts an unchastened eye-lid! But her courage is a flaw of the intelligence. Many poems are concerned with the tension between engagement and withdrawal, relationship and self-sufficiency, a tension that ultimately she may not have been able to resolve. But none of these virtues were apparent to 19 year old A Y (Yvor) Winters of Chicago, who in the October 1919 Little Review made an early foray into the combative and judgemental criticism for which he was to become notorious. A second generation Imagist, who later abandoned the modern for a highly conservative formalism, the precocious Winters slammed into Dismorr’s “viewy” philosophising, her tendency to think in manifestos and what he saw as her “meticulous verbosity”. Winters’s pet hates were romanticism and “formlessness” in verse; how Dismorr’s style must have grated on his sensibilities! Life flows into Death above Time’s translucent contours. In the December Little Review, John Rodker, who had taken over Pound’s “foreign editorship”, came to Dismorr’s defence. Interestingly, he pointed up the significant lack of any editorial rebuke to Winters by “jh” (Jane Heap, Margaret Anderson’s co-editor) and made it quite clear that he knew the identity of “Mr Winters”, that he was a woman and moreover, a woman who had been “touched on the raw” by Dismorr’s “acute psychological analyses”. Rodker was off target and Winters unfortunately was only too real, but, as Quentin Stevenson has pointed out, his jabs at the “child of a millionaire” and “newly rich lady” suggest that he had some personal knowledge of Dismorr’s relatively affluent background. Who did Rodker have in mind? In the September number Editor Margaret Anderson had appended an intrusive and waspish comment to Dismorr’s aesthetic manifesto “Critical Suggestions”, finding her aphorisms either obvious, confused or untrue. Perhaps this had been enough to ring bells for Rodker, but in fact this sort of high handedness was not unusual for Anderson, who was only too ready to abuse her editorial position by abusing her own contributors regularly and indiscriminately. No aesthetic achievement was ever the outcome of a metaphysical idea. Pictures of Faith, Hope, Charity are portraits of women. All art has a physical basis. This pigment, disposed by the ultimate vibrations of force, paints the universe in a contemporary mode. I am glad it is up-to-date and ephemeral; that I am to be diverted by a succession of fantasies. Between them, Anderson and Winters managed to wound Dismorr’s confidence fatally; she contributed nothing further to The Little Review and had no more poems published for fifteen years.